Conceived and Directed by Kate Denborough. Created in collaboration with the cast. KAGE for the Melbourne International Jazz Festival. At Chunky Move, 11 Sturt Street – Southbank. 1 to 10 June 2017, then Adelaide. 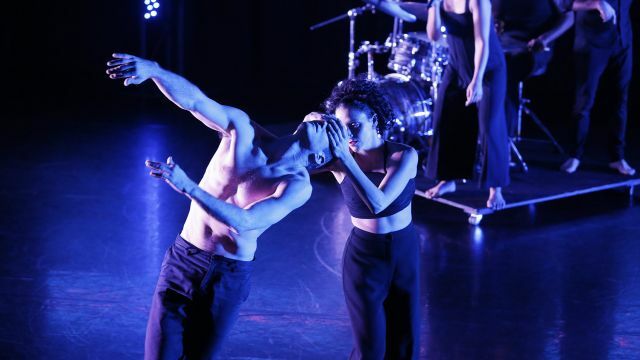 The remarkable aspect of this performance is that not all the dancers are hearing. Out of Earshotbrings its audience closer to an awareness of how individuals experience sound and vibration and how it may and may not inform movement. We all have our own unique rhythms - a kind of beat of your own internal drum. As a hearing person it is fascinating to consider what a Deaf person actually hears or feels or sees with regard to sound and rhythms/pulses. 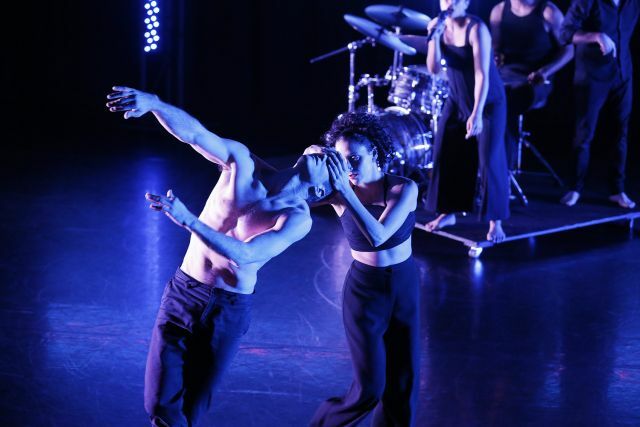 In this dance performance, part of The Melbourne Jazz Festival, sound is introduced as body percussion played by Myele Manzanza on the dancers’ bodies. Eventually Manzanza moves to a featured drum kit that he plays at intervals throughout. The sound is both explosive and at times acutely sensitive. Sound is echoed visually in a strip of illumination around the walls of the performance space. In this way sound cues are audial - literal sound and vibrations. And cues are also visual - percussive instruments being played, projected images of sound waves and other performers moving. All performers are positioned to respond to this variety of stimuli. Intrinsically Out of Earshot appears to be about relating to others. It is the non-verbal communication and the intimate dancing relationships that really seem to be at the heart of what activates movement and generates meaning in this work. Dancers are generally, uniquely, completely visible - exposed through their presence in front of an audience. Their integrity and vulnerability allows them to speak genuinely and sincerely to us. I think this sense of openness is intensified in with the inclusion of a Deaf dancer. Anna Seymour, who was born profoundly deaf,works as an equal collaborator – one of a quartet of dancers. Throughout there is an intensity of communication between performers that is possibly a heightened awareness to the importance of visual cues. Gerard Van Dyck, always beguiling to watch, delights with his sense of humour, particularly towards the end of the performance. Timothy Ohl delivers some extraordinarily moves. I found myself gasping at a number of his rolls. Elle Evangelista is enchanting to observe. As creator/director Kate Denborough plays with perceptions of the embodiment of sound. And although Anna Seymour’s point of difference is a pivotal aspect of the work there is no sense that she is actually any different to any of the other dancers. In fact if one didn’t know she is Deaf one would be none the wiser. A very unique and seminal ensemble piece that we are bound to be talking about for years to come.